Definition at line 41 of file metapropertyt.h. Definition at line 45 of file metapropertyt.h. Definition at line 69 of file metapropertyt.h. Definition at line 96 of file metapropertyt.h. Definition at line 89 of file metapropertyt.h. Definition at line 82 of file metapropertyt.h. Definition at line 75 of file metapropertyt.h. Definition at line 48 of file metapropertyt.h. 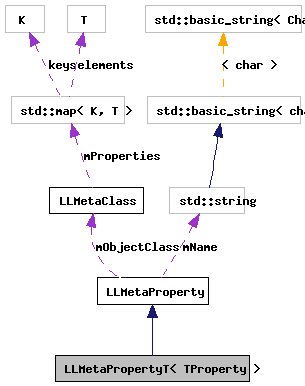 References LLMetaProperty::checkObjectClass(), and LLMetaPropertyT< TProperty >::getProperty(). Definition at line 121 of file metapropertyt.h. Definition at line 115 of file metapropertyt.h. Definition at line 109 of file metapropertyt.h. Definition at line 103 of file metapropertyt.h. Definition at line 62 of file metapropertyt.h. Implemented in LLMetaPropertyTT< TObject, TProperty >, and LLMetaPropertyPtrTT< TObject, TProperty >. Referenced by LLMetaPropertyT< TProperty >::get(), and LLMetaPropertyT< TProperty >::getLLSD().